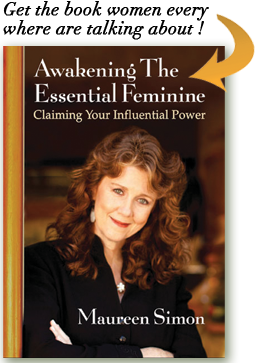 Fully Showing up in your Business or Work – Keys to Optimum Success by Maureen Simon – founder of The Essential Feminine Company and mentor to hundreds of businesswomen for over 25 years. Why — because they are not fully showing up with what they have to offer or are doing work that they truly do not enjoy…. I participated in your webinar this afternoon entitled “Fully Showing Up in Your Business or Work”. Would you please share your handouts with me? I would appreciate it!